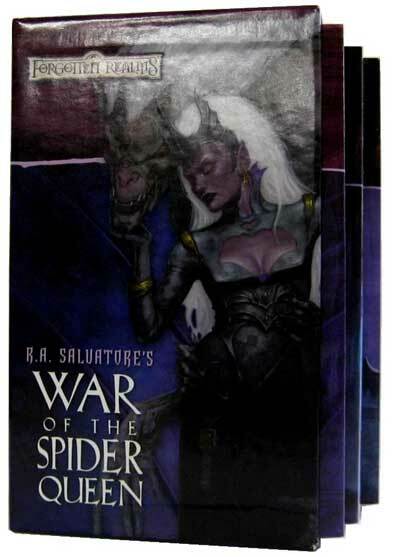 This striking new boxed set contains the first three titles from R.A. Salvatore's War of the Spider Queen six-book series: Dissolution, Insurrection, and Condemnation. Each author is a veteran writer who is well-known to Forgotten Realms fans, and multiple-time best-selling author R.A. Salvatore consulted on the entire series of titles. When the evil goddess of spiders stops answering the prayers of her faithful, the matriarchal theocracy of the dreaded dark elves teeters on the brink of ruin. A hand-picked team of powerful drow embark on an epic quest to answer a simple question: Where is the Queen of the Demonweb Pits? The question may be simple, but finding the answer could either save or destroy an entire civilization.